Well, since Mojo Monday is celebrating, I thought I would play along with their sketch. First of all a huge congrats to Mojo Monday....WOW...and every week they have so many people playing along their challenges, I am always amazed. Here is their sketch from today, in case you would like to give it a try. 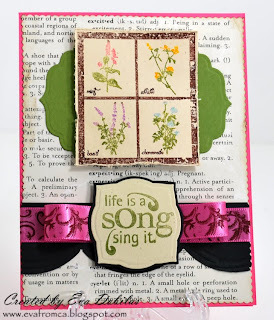 And here is my take on it using some October Afternoon paper and Unity stamps. Well, that is all I have to show you for today. Hope you like this. Have a fabulous day!! !